As we reported yesterday, tipster Al M. noticed that a new Thai spot is poised to take over a space that was once occupied by Rromd, The Fizzary and Haight Street Gelato, but we weren't able to confirm the restaurant's name. 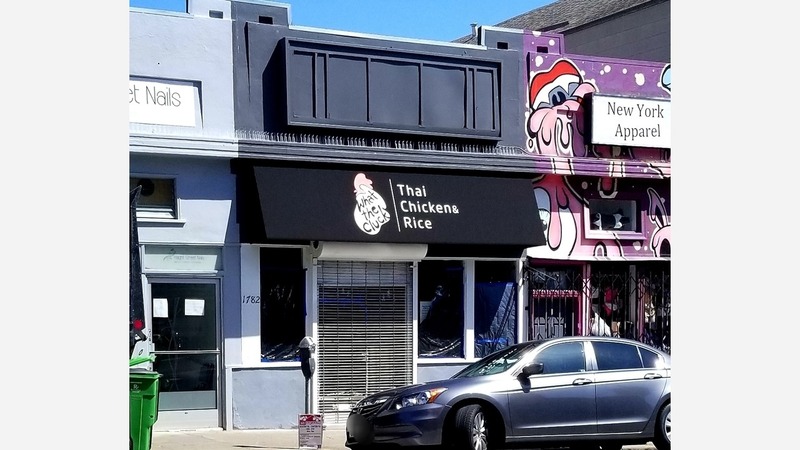 Today, the mystery has been solved: What the Cluck Thai Chicken & Rice will join the Upper Haight's culinary community at 1782 Haight St. (between Shrader and Cole streets). Though there isn't much information available online as of yet -- we've only been able to confirm the construction crew that's doing the renovations -- an awning with new signage went up yesterday. Public records indicate that new flooring is being installed, along with kitchen hoods, bar stools and a service counter. According to our sources, What The Cluck will specialize in khao mun gai poached chicken breast, which is usually served with rice, cucumbers, cilantro and a side of chicken broth. When Al spoke to someone on the scene, he was told that "quick bites" and Thai-style street food dishes would also be on offer. As for the interior, expect to see a "modern decor with a matching counter to the right as you walk in," said Al. Additionally, there will be seating for about 17 people. If all goes to plan, it appears the new spot should open sometime this month. Thanks to the wind beneath our wings, the omniscient Al M.!